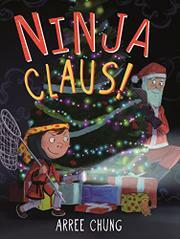 Maxwell the ninja tries to capture Santa in this third offering in Chung’s popular series, following Ninja! (2014) and Ninja! Attack of the Clan (2016). Dressed in his ninja suit, Maxwell is determined to see Santa on Christmas Eve. He devises a trap with a handwritten note and multiple ropes to catch Santa in the act of delivering toys. Instead, the trap catches Maxwell’s dad when he sits down in a red recliner to sample the snacks set out for Santa. The family goes back to bed, no one spotting Santa already in the house and hiding behind the Christmas tree. Santa uses his Ninja Claus skills to carefully avoid additional traps, leaving a handwritten note for Maxwell and a gift of elf-made ninja shoes. Cleverly composed illustrations use a combination of graphic panels, traditional picture-book illustrations, and multiple handwritten notes between Maxwell and Santa, providing a delightfully varied means of conveying the story. Speech balloons, sound effects set in display type, and appearances by Maxwell’s hamster add more layers of interest to the overall design. Maxwell and his small sister are biracial; his mom is Asian and his dad is white; Santa is white.